With its snow kissed peaks and fresh alpine air, Switzerland is one of Europe’s most scenic countries. It is also home to a lot of hydropower. According to the Swiss Federal Office of Energy (SFOE), hydropower accounts for roughly 56 percent of its domestic electricity production. At the Hydraulic Constructions Laboratory (LCH) in Lausanne, researchers are looking to hone and optimize hydropower facilities. 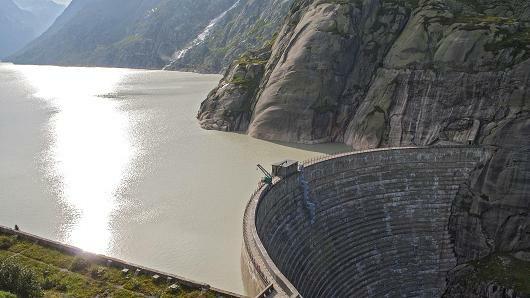 “This Laboratory was created in parallel with the development of water infrastructure in Switzerland – mainly (the) construction of dams, but also of course hydropower,” Anton Schleiss, head of the LCH and president of the International Commission on Large Dams, told CNBC’s Sustainable Energy. A great deal of emphasis is placed on the maintenance of hydropower facilities. “Rehabilitation is very important for our structures related to hydropower and flood protection,” the LCH’s Giovanni de Cesare, said. “These infrastructures are ageing and we have to rehabilitate regarding security, energy production, and also ecological rehabilitation,” he added. Given the scale of many hydropower facilities, their impact can be considerable, whether it be the displacement of local people or damage to wildlife. As such, sympathetic design needs to be considered. “When we build a dam, this becomes an obstacle for fish migration, therefore we have to install a fish pass which allows the fish to migrate freely and reproduce in the upstream rivers,” de Cesare said.